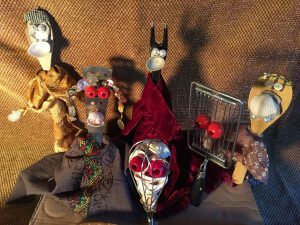 Join Blainor McGough and Dr. Rich Entel for a children’s workshop creating puppets using found objects, being held in the Sam L. Cohen Children’s Library from , for children ages 7-12. The workshop is inspired by the work of Ashley Bryan and coincides with the Portland Museum of Art’s exhibit, Painter and Poet: The Art of Ashley Bryan. Before we dive into puppet making, Dr. Rich Entel will speak a bit about his friendship with Ashley Bryan and the book he collaborated on, Ashley Bryan’s Puppets. Using a kitchen utensil I (i.e. wooden spoon) and found objects such as shells, buttons, nuts, hardware, beads, paper and fabric scraps, children will be able to create their own puppets. Materials will be provided, but participants are welcome to bring in their own materials. Rich Entel of Portland, Maine, attended the Skowhegan School of Painting and Sculpture and was an artist-in-residence at the MacDowell Colony. His work has been included in a Portland Museum Along with continuous exploration in art, Entel works in the community as a family physician specializing in addiction medicine.